Southern Florida is certainly a sunny place to be, but West Palm Beach is THE place to go for glam fun in the sun! 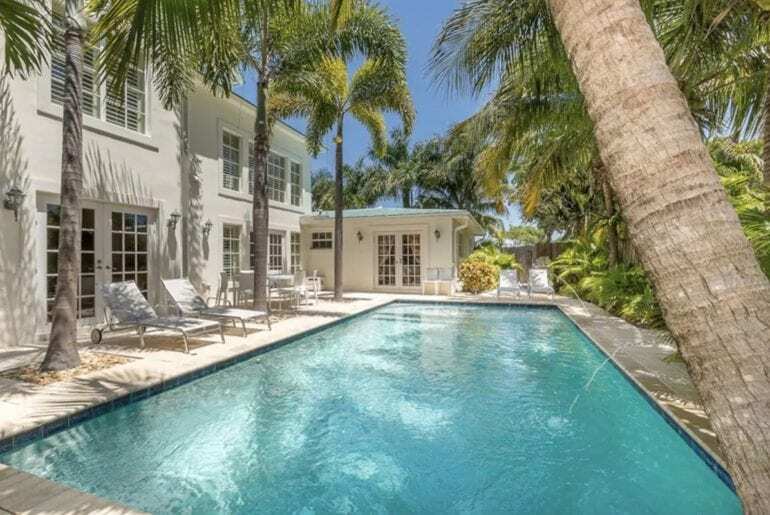 We couldn’t resist rounding up this fun list of ultra-glamorous West Palm Beach Airbnb properties, ideal for your next holiday in the sun. Check out Clematis Street and CityPlace for action, with nightlife, clubs, bars, and plentiful shopping opportunities. If you want to hit up some culture, why not head to the Norton Museum of Art, where you’ll find examples from all over the world and locally too. Catch a play or show at the Kravis Center, or you could simply find an ideal place to lounge, with a stunning view of the sea. Palm Beach is just a few minutes away on foot, so staying in the West Palm Beach area is ideal for those who want a quieter, more chilled out and sophisticated base, but also want the freedom to roam. 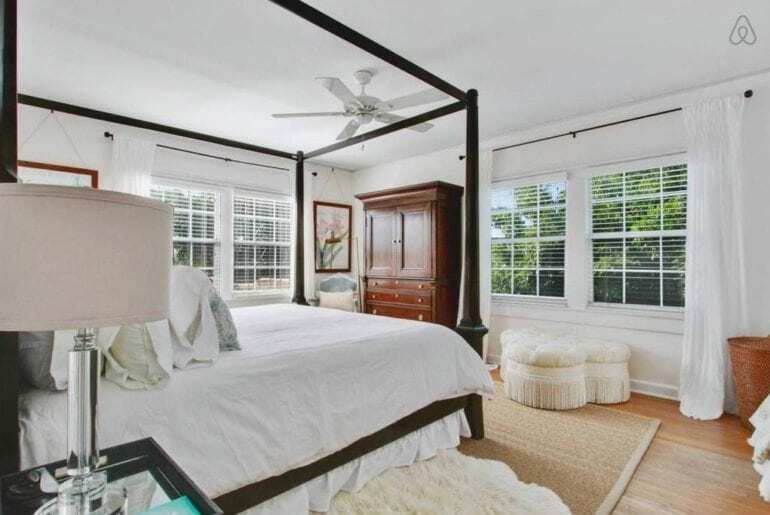 Of course, you’ll want somewhere to lay your head which epitomises West Palm Beach sophistication, and in that case, check out our list of ultra-glamorous West Palm Beach Airbnbs! With the space to house 11 guests, this sprawling luxury West Palm Beach mansion is the ideal spot for large groups and families. 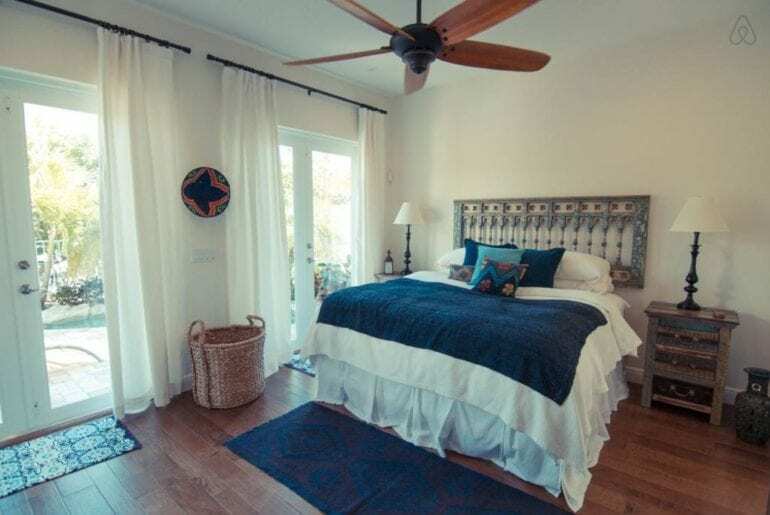 There are 8 huge bedrooms and 4 complete bathrooms, which are all decorated in a sumptuous, elegant style. Outside is where the glamour really hits, with a stunning pool surrounded by the white-washed exterior. 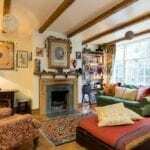 This property wouldn’t look out of place on a TV home decoration programme! 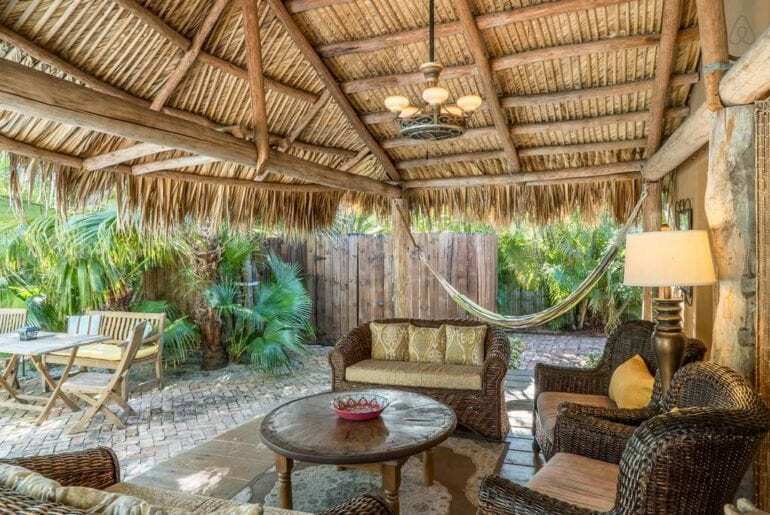 Enjoy the home’s spacious sun deck with loungers, an al fresco dining area, and plentiful palm trees to give you that little extra shade when you need it. Within close reach, you’ll find many bars and restaurants, but with everything you need for a Florida vacation on-site, there’s a chance you won’t want to leave at all. Of course, this kind of size and luxury comes at a price, from $1400 per night, so bring a large group and enjoy living large together! This is definitely one of the most glamorous West Palm Beach Airbnbs we found. 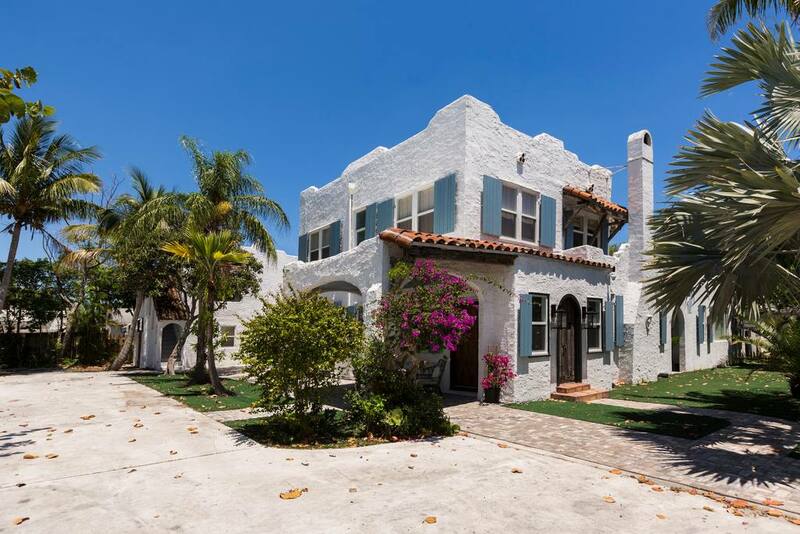 The colourful, Spanish hacienda style sets this large West Palm Beach casa apart! 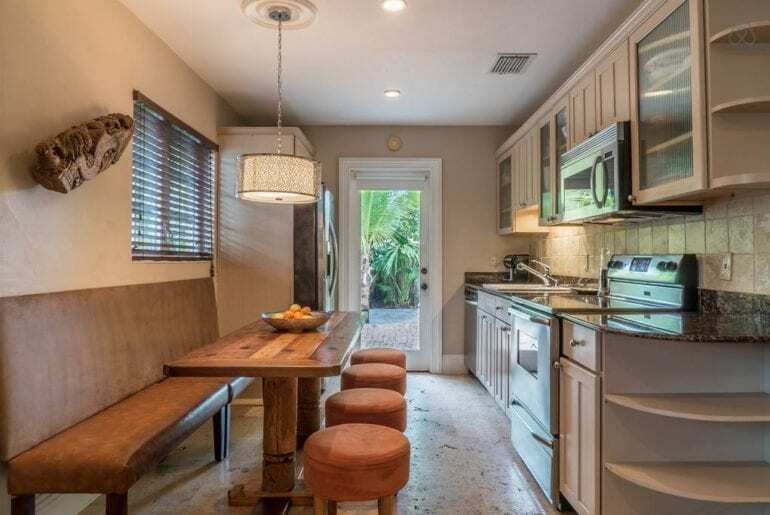 Surrounded by lush greenery, there is shade in abundance from that harsh Florida sun, and from $600 per night the entire home fits up to eight people inside, with four large bedrooms and three full bathrooms. 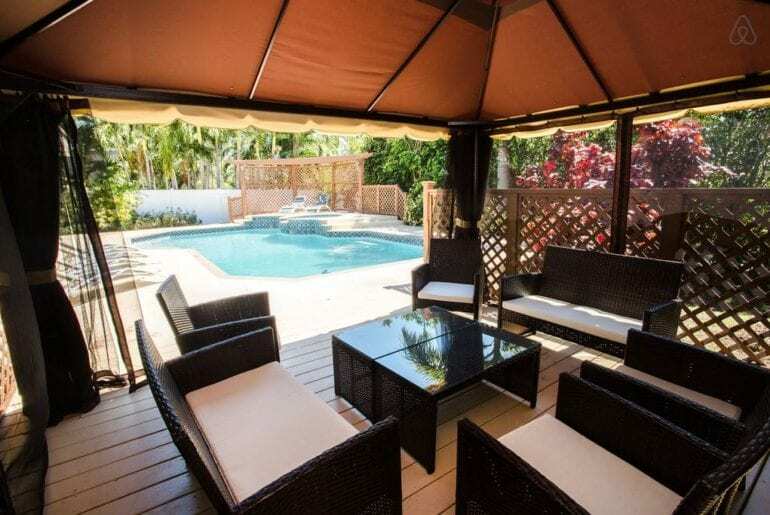 The outdoor section of this large West Palm Beach Airbnb has a beautiful swimming pool, with a brick-paved deck and surrounding fence for total privacy. You’ll feel like you’ve been transported to a Spanish-style hacienda, and you won’t be far wrong. The property is actually split over two buildings, with the main home and a small cottage within the same set of grounds. This is ideal for families with older children, or groups of friends. You’re also never too far away from vibrant restaurants and shops, not to mention the beach! 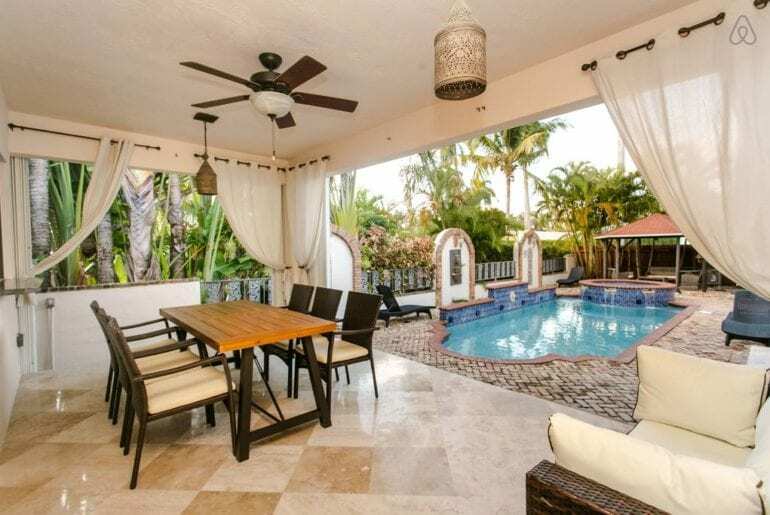 You can live the ultimate West Palm Beach dream on your next Florida vacation by choosing this bright and beautiful beach house, located just 300m away from the shores of Juno Beach. 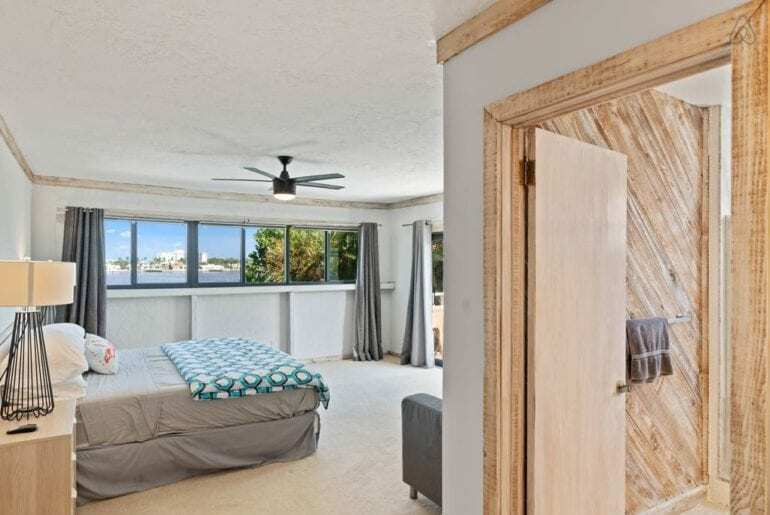 This is certainly one of the most ultra-glamorous West Palm Beach Airbnbs both for its beachside location, modern facilities, and warm, rustic decor. This dreamy property has space for five guests, with two large and beautifully decorated bedrooms and two full bathrooms, complete with roll tub for a luxurious evening soak! The property has a swimming pool, surrounded by shady palm trees, as well as space to eat al fresco on cooler evenings. Despite being set in a residential, quiet area of West Palm Beach, you’re never too far away from a range of restaurants and nightlife options, which can be reached by a few minutes in a car, or by walking on a mild evening. For large groups of up to 12 people, this beautiful four-bedroom home with a resort-style backyard is just perfect. With its huge swimming pool, luxurious cabana, sun loungers, and outdoor dining space, you’ll probably never want to go inside! Thankfully, the interior is just as impressive. 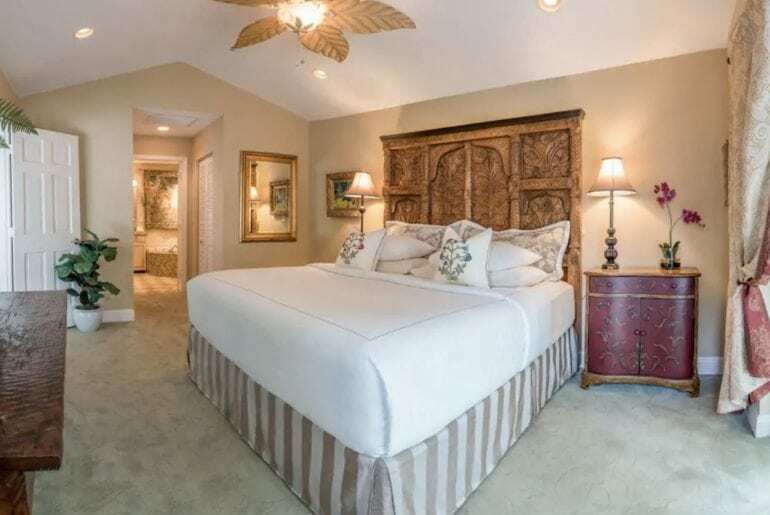 With four large bedrooms decorated in a relaxed, coastal style, there’s space for quite a large group or family to enjoy a relaxing Florida vacation. 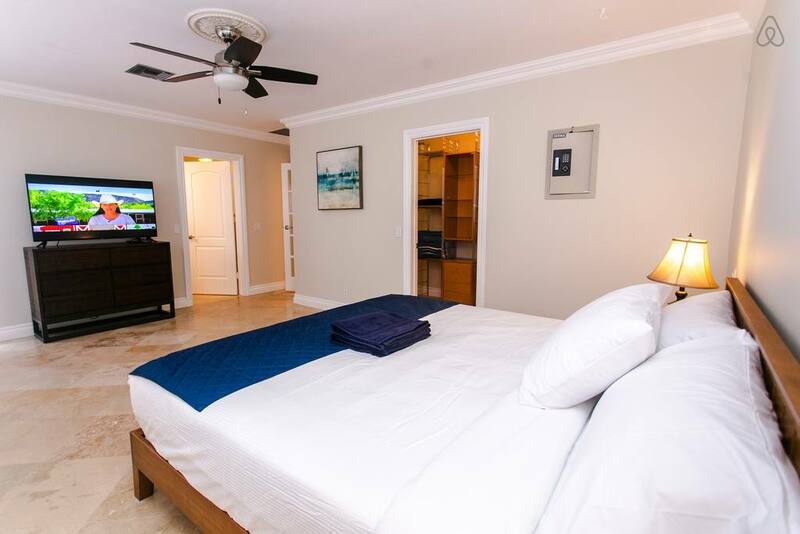 The Dania Beach and Casino are a few minutes away on foot, so you can easily spend your evenings on the famous Hollywood Beach and Boardwalk. 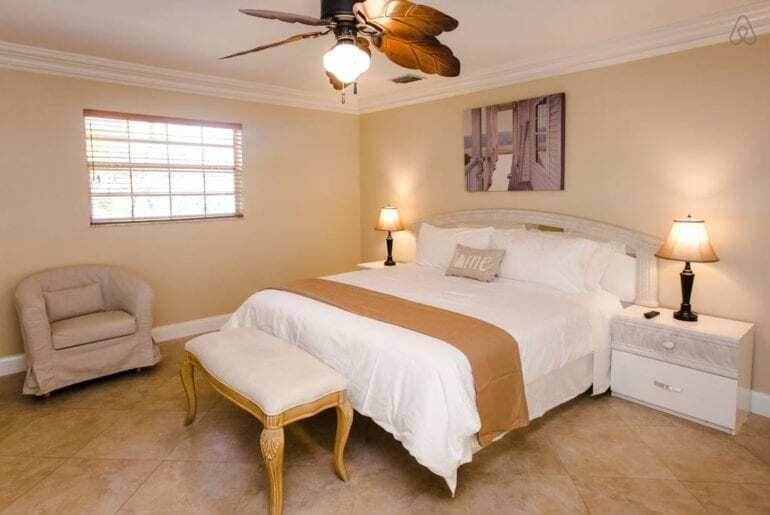 Retreat back to your glamorous West Palm Beach Airbnb for a relaxing swim or hang out with your group in the large living space. 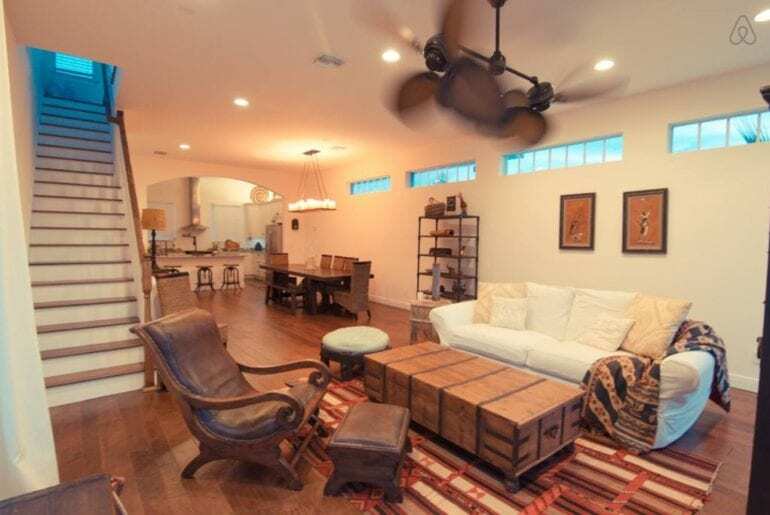 This property is available from around $600 a night, which is an absolute steal for a high-end vacation rental of this size! Who doesn’t want to stay in their very own villa, complete with outdoor pool and shady cabana? Of course you do, and it can be yours in West Palm Beach from about $815 a night. 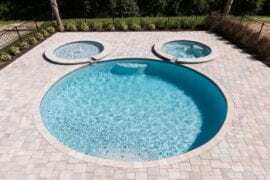 This magnificent, 5-bedroom villa with heated pool has space for up to 10 guests, making it an excellent choice for a group of friends or a big family visiting Florida together. 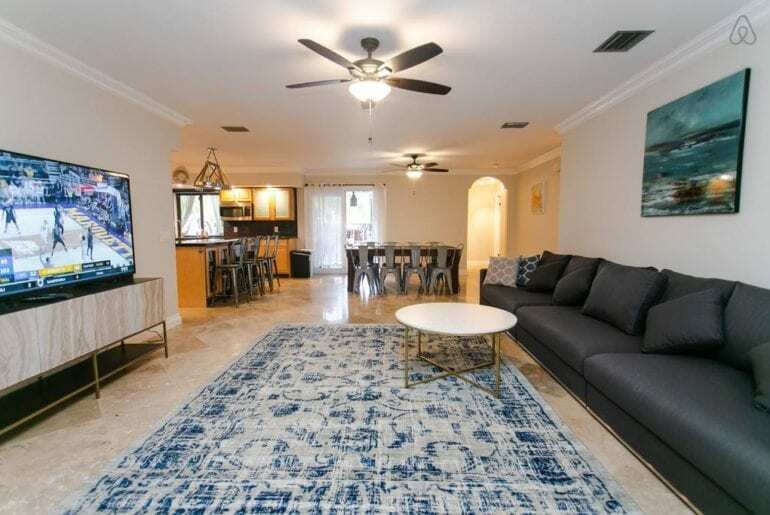 The living space is large and open-concept, with a flatscreen TV and comfortable sofas for chilling out before you head out to Hollywood Beach nearby. The swimming pool is enormous and heated, with a dreamy open dining space overlooking the back patio. You’re close to everything by choosing this gorgeous villa, but you’re also not likely to want to leave it, thanks to having everything you could possibly need inside! 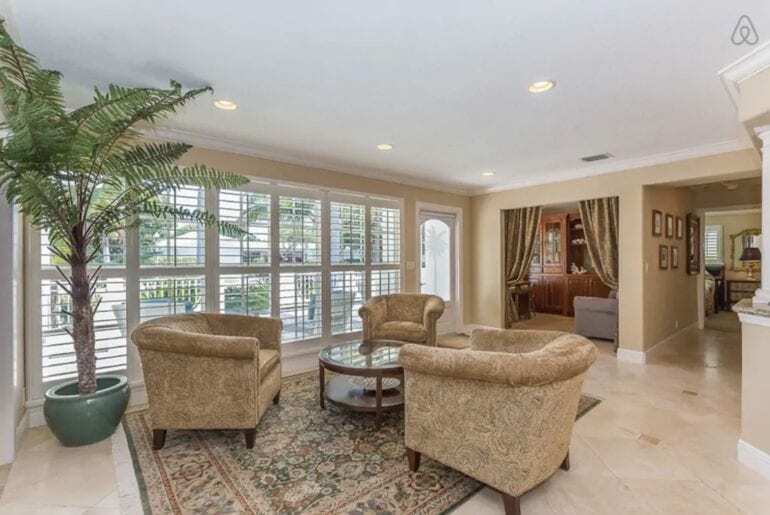 This property is ideal for large groups or families, and those who really want to explore the West Palm Beach area in total luxury. Wait a second, is this West Palm Beach or a tropical Balinese village? We just adore this incredible, tropical bungalow-style home and yes, it is definitely in West Palm Beach! Hands down, the highlight of this unique Airbnb is the saltwater swimming pool and gorgeous, tropical backyard complete with shady bamboo cabanas, plenty of sun loungers, and space to dine al fresco. 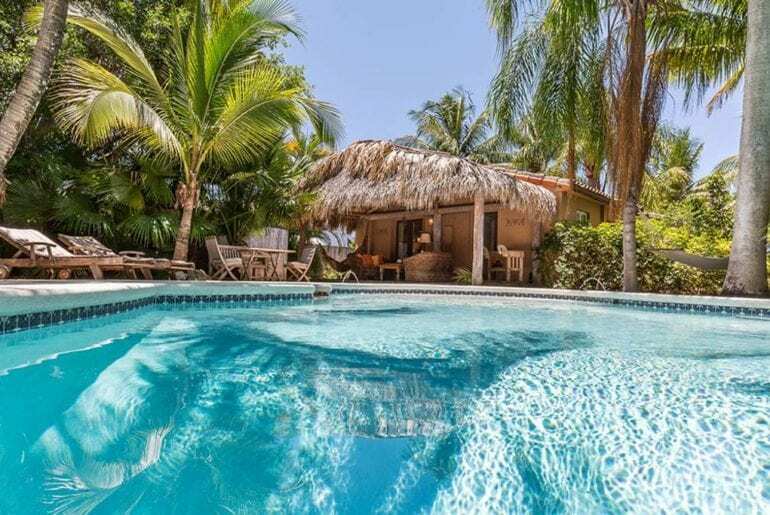 The ultimate oasis in South Florida, this enchanting home sleeps up to 7 guests and could be all yours for a cool $631 a night. While the backyard and outdoor spaces are jaw-droppingly beautiful, the interior spaces will not disappoint either. Fresh, modern cabinetry and new appliances live cozily alongside more eclectic textures and Moroccan-style archways. While you may never want to leave one of the most glamorous West Palm Beach Airbnbs we’ve ever seen, you’re never far from WPB’s best restaurants and shops in this charming, historic neighbourhood. If you’re ready to book the ultimate getaway with oh, say, 16 of your closest friends or family members, have we got the property for you! Feast your eyes on this jaw-dropping tropical Airbnb: a sprawling, Spanish-style estate near the beach and downtown. 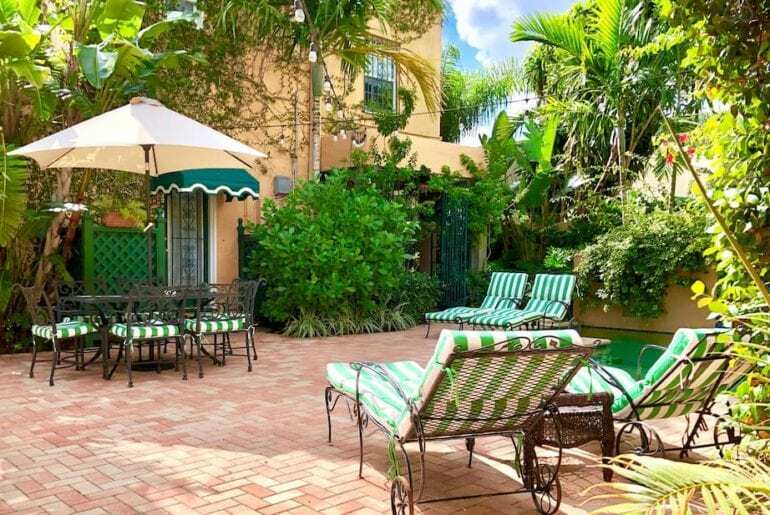 If your timing’s right, you can snag one of the most glamorous West Palm Beach Airbnbs ever for just $800 a night. This Airbnb is actually a sprawling, half-acre compound consisting of four different Spanish-style buildings on one estate. The main house has four bedrooms, then there’s two separate one-bedroom apartments AND a separate 1200 sq.ft. studio. Wow! The thoughtful, hacienda-style design and extraordinary layout give everyone in your group a feeling of luxury, space, and privacy. 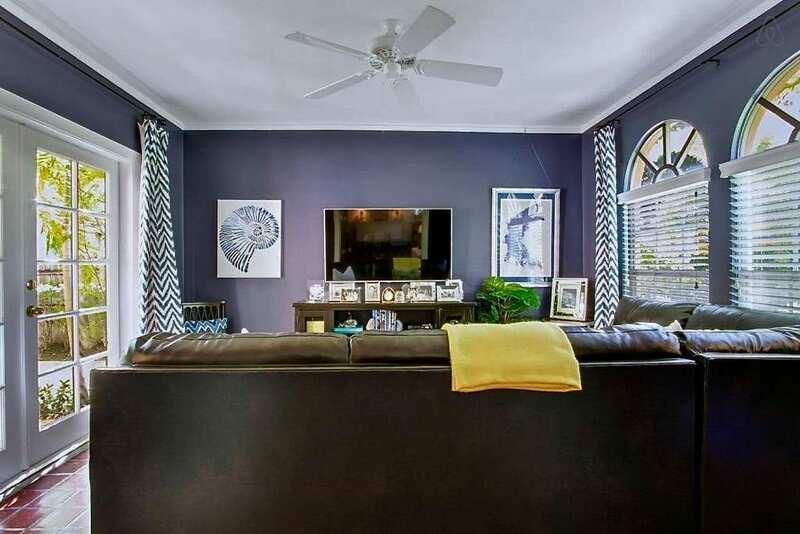 All of this and more, just minutes away from the beach and downtown West Palm. 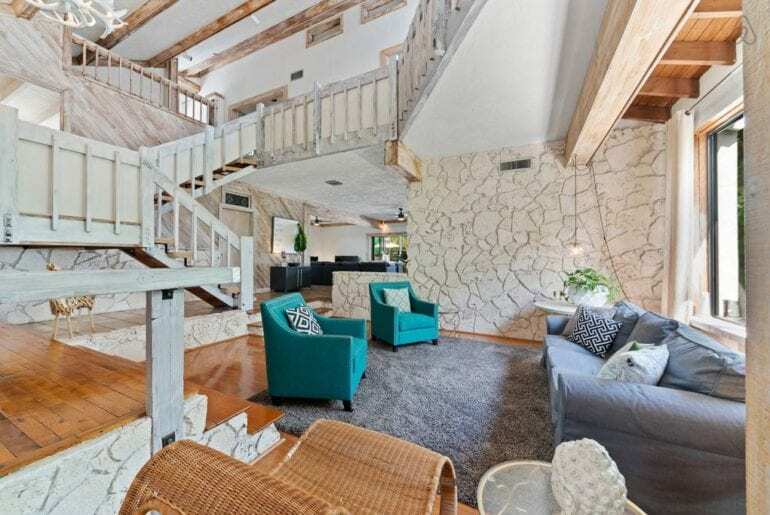 Just in case you thought we were done, we’ve saved one of the most glamorous Airbnb West Palm Beach properties for last! 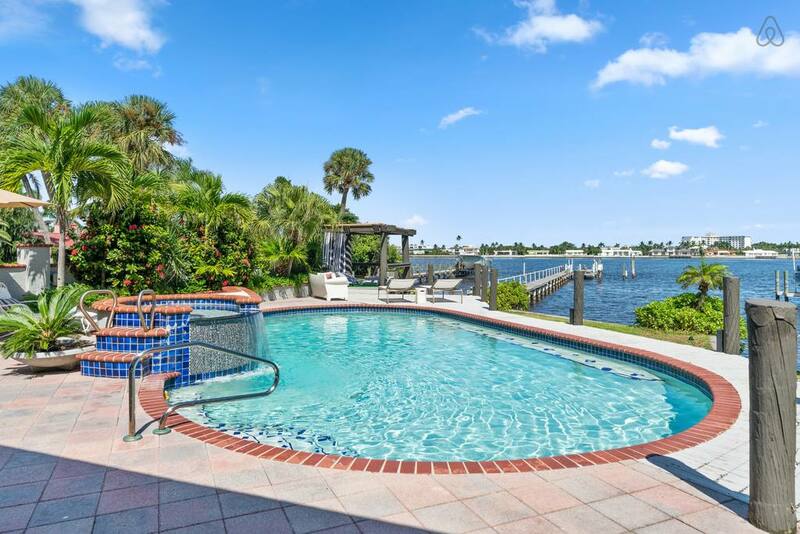 This luxurious, waterfront dream home is located just minutes from West Palm Beach by car, perched right on the water. 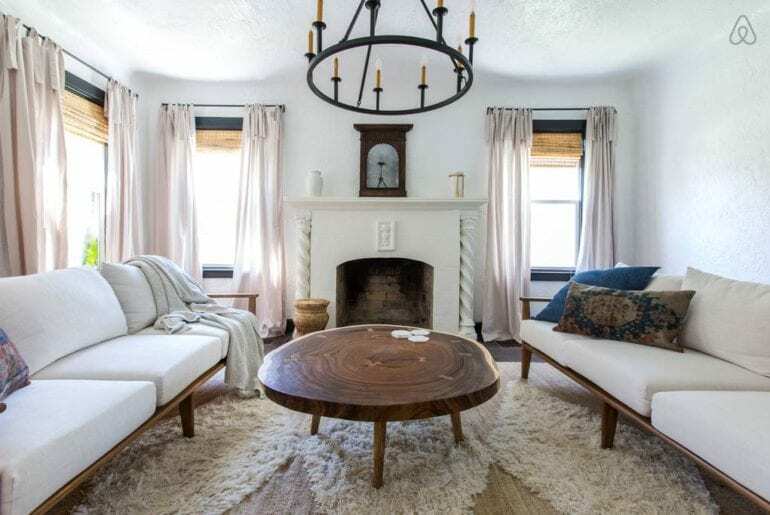 This house is packing some serious style, with six stunning bedrooms, an enormous open-concept floor plan with sky-high ceilings, and incredible outdoor spaces for entertaining. 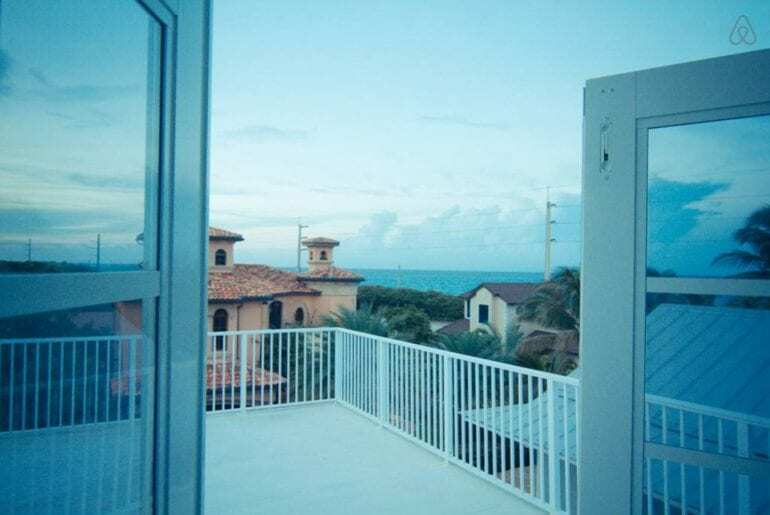 Views of the water are found in practically every room of the house, so you’ll always feel a sense of calm and tranquillity on your West Palm Beach vacation. There is a large swimming pool and jacuzzi overlooking the boat dock and ample sun loungers. We love the charming outdoor bar and covered lounge spaces for entertaining friends or family throughout the day and well into the evening. With downtown West Palm Beach just a short drive away, this space is ideal for a big group holiday in absolutely stunning surroundings.